Sometime during the last month, I saw an image of an Archimedean Spiral and was wondering whether I could recreate the same in SSRS. The Archimedean Spiral is actually a scatter line chart (a combination of scatter chart and line chart). I have over 6+ years of experience creating visualizations using SSRS, but the closest I had come to such a visualization was the Scatter Chart. A scatter chart doesn’t tell the full story as we don’t know the chronology in which the data was collected. 1) Create a dataset with the two measures (X & Y coordinates) and a category. Since I am trying to replicate the Archimedean spiral, I used the formula given below to come up with the coordinates and category. You can see that my category (the Pos field) is just a running number used for determining the order. 2) Drag and drop a Smooth Line with Markers chart into the layout. Use Y as the value and Pos as the Category group. Note that X is the name of the field in our dataset and should be replaced by whatever is the field name that should be present in the X axis. 4) Preview it, and you should be able to see our Archimedean Spiral. One thing to note here is that the lines are connected based on the sorting order of the Category group field. So in case you are using a name field like month (January, February, etc), ensure that the sorting order is based on the month number (else you might not get the right results). Feel free to download the report file from here. Though scatter line charts might not be as useful as sparklines, they have their place in data visualization and it is always good to know that you can make one using SSRS. Of recent, I have been getting mails from my readers whether I have forsaken Reporting Services for Analysis Services in my blog. I want to reassure all of you that this is not the case and that I will be equally focussing on both the technologies. Just that there is a lot of development happening in the AS side and it is very important for all of us to keep on expanding our skillsets and building our expertise. 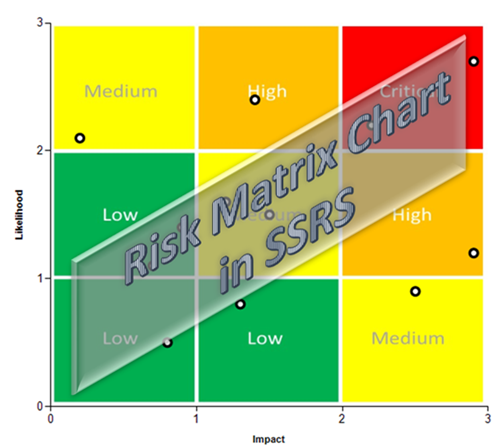 That said, I am writing this post on how to create a Risk Matrix chart in SSRS for all of you guys as a new year gift from my side. 1) Create an image with the required risk scores in excel / PowerPoint / Paint. I came up with the following image. This will server as the background image of our scatter chart. Add this image to the report. 3) Go to the toolbox and drag and drop a chart item into the report body. Select the chart type as Scatter chart and click on OK.
4) Drag and drop Likelihood from the dataset fields list into the Values and then select Impact as the X Value in the chart. Also drop Project field into the Category Group of the chart. 5) Change the Axis titles to Likelihood and Impact for the Y and X axis respectively. Then go to both of the axis properties, and set the minimum as 0, maximum as 3 and Interval as 1. 6) Now click on the chart area and add the RiskMatrix image as the background image. You might also want to hide the major gridlines for the horizontal and vertical axis. 7) Now with a bit of cosmetic changes to your marker colours, we arrive upon the end result. It is a good practice to enable the tooltips on the points, so that we can just hover our mouse to find out the project names. The beauty of this approach is that it can be extended to a lot of other scenarios. For eg, I remember using this approach to answer a scatter chart with four quadrants question in the MSDN forum. Wishing all of you a very prosperous new year! Ok, this post was supposed to come out a lot earlier but I was just too lazy. Complacency is a struggle we all have to fight and I would be lying if I say that I am immune to all these. This post is a direct result of a few forum posts where people said that charts with data tables are not possible in SSRS (unless you add a tablix beneath the chart and spend umpteen hours trying to align both of them!). Working with SSRS is like making love to a woman – you need to know the woman and what makes her click well for a fabulous time. Well, you can still manage without knowing her well enough, just that it won’t be that awesome! In SSRS, having a tablix beneath the chart serves as an ok workaround as long as the number of fields in the category is fixed. When the number of fields change change (lets say, when the value of a report parameter changes), the alignment goes for a toss. Here, I will be demonstrating a much more elegant way to add the data tables than trying to align the tablix and chart. 1) Create a simple dataset from the AdventureWorks cube, displaying the Month, Category and Internet Sales Amount. Add a parameter for Calendar year with a default value of CY 2007. 3) Add two rows outside group above the category row as shown below. You might also want to do some quick formatting like hiding the textbox borders for the top row. 6) Once this is done, the only part remaining is to make a chart, format it and then place it on the top right textbox. For that, drag and drop a stacked column chart outside of the matrix, and then drag Internet_Sales_amount on the Values, Month on the Category Groups and Category on the Series Groups as shown below. 9) Hide the labels for the vertical axis. 10) We need to place this chart within the tablix and make it repeat for each of the month. But before that, we need to make sure that there are no white spaces within the chart area, and hence change the following properties for the Chart Area. Also set the BorderStyle property for the Chart as None and disable the MajorTickMarks for the Vertical Axis. 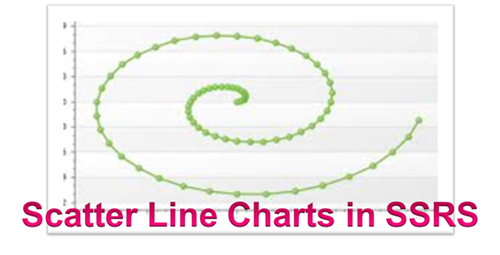 This will also help in making the charts look continuous. In spite of being in the US for more than 8 months now, I still haven’t lost touch with the English Premier League (football). For those who don’t know me, I am a big fan of Manchester United and hence by default, loathe Manchester City. They are like our biggest rivals and won the Premier League last season, and that too in the last minute of the last game! I never thought that the day would come when I would even mention them in my blog, let alone praise them. But then last week, they started a new crowdsourced analytics project called MCFC Analytics and I can’t stop thinking about what a fantastic idea it is. Needless to say, I was among the first set of people to request the data from them and have been playing around with it this week. I was also reading about the brushing and linking visualization techniques, and hence thought of using this data for illustrating this concept within SSRS. 1) Download the data from http://www.mcfc.co.uk/mcfcanalytics and then import it to a table in your SQL Server database called Players. 2) Create a new report called MCFC, and point the datasource to your database containing the Players table. 3) Create 2 hidden report parameters – RP_Field and RP_FValue with no available values and All as the default value. The RP_Field will be used for determining the series field of the chart (can be Venue, GoalType, Starts, Team or Opposition) and the RP_FValue will actually pass the field value which is being clicked. 5) Make 5 stacked bar charts with [sum(Gls)] as Values and [Srs] as the Series Group. The category for the five charts are Venue, GoalType, Starts, Team and Opposition respectively. 6) Change the Color expression of all the five charts as below =iif(Fields!Srs.Value=”0″,”Silver”,”00AFEF”) This is done so that we can see the brushing effect in the bars. Similarly, set the action properties of the other 4 charts. You can also add the category group (for eg, the Venue chart will have Venue field) as a secondary sort option, as shown below. This sorting will make it easier for us to understand the data. 11) Click on any of the bars, and you shall see the report getting the brushing effect. For eg, you can see it as shown below when Manchester City is clicked in the Team chart. Through this chart, we can easily see that Man Utd had more home wins than away, scored more goals through open play and scored most against Arsenal. If you want to see which team scored most through Corners, click on the corners bar in Goals From chart. Very easily, you can see that Manchester city scored the most and Blackburn Rovers conceded the most goals through corners. You can already see the power of linking the charts instead of keeping it as individual unlinked ones. 12) Click on the Reset button to bring the report to the original state in step 10. This post has been written keeping an experienced SSRS developer in mind. If you felt that the explanations are not enough, feel free to download the report file and check yourselves. As always, I am interested in hearing your views and opinions about this. 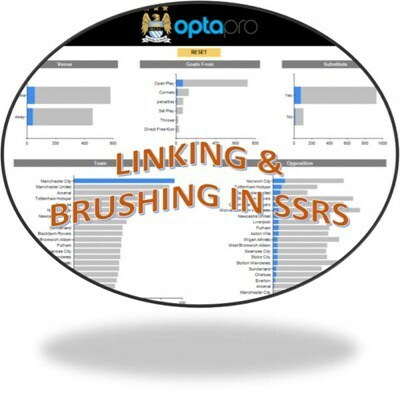 Feel free to comment on the MCFC Analytics project as well as this brushing concept. Note: I am part of the core team that is organizing a SQL Saturday in Charlotte, NC on October 27. If you are around the North Carolina region, go and register yourselves for the event here. If you are far from us and can’t come for the event, spread some love on twitter and other social media sites using the hash tag #sqlsat174. ,Fields!ParameterValue.Value) 14) Preview the report and now you can also see this new feature added in your report. Now there is an obvious disadvantage with slicers in SSRS that the report needs to be refreshed and so you will see the “Loading” screen when the slicers are changed. But this is just a small issue and with fast reports, this might be under a second. I know this is a long post and that there are a lot of report expressions in this post, but if read carefully, you can get to know a lot of important concepts which can be applied to other scenarios. If anyone needs the report file, feel free to click and download it from the link. As for me, I am already thinking on another type of visualization involving these slicers, hope to put it out as a blog soon! a) The actions that were defined on the frist bar chart was not working for some bars. b) The tooltips defined for the second bar chart was not working. c) The tooltips defined for the bullet chart was not working. d) The tooltips defined for the line chart was not working. In addition to that, the lines appeared to be jaggy and seemed to have some pixels cut off from them. Click and expand the image above to see jagged effect on the line chart. Also, the report seemed to take more time in displaying the charts in SharePoint than when I had previewed it in the SSDT environment. It is to be noted that the actions as well as the tooltips in the tablix columns without the charts worked fine. 4) Now to solve the issue, all you have to do is to enclose each chart in a rectangle before using it in the cell of the tablix. 5) Once you have done the above step for every chart, save and deploy the report to SharePoint. You can preview the report and see that now the tooltips as well as the actions are working for the charts. Also, the line charts seemed to be smooth and devoid of the jagged line effects seen earlier. Performance also seems to be much better than before. Moral of the story – If you are using inline charts in SSRS SharePoint Integrated mode and facing similar issues, then try to use the charts within a rectangle. This might save you some headaches later. When I came to the US six months ago, I had set myself a goal of doing more presentations than I did last year in the UK (which was two – one at the London BI User group and another at SQLBits 9). Well, I am glad to say that I achieved this goal within the last two months where I was able to present at four SQL Saturdays (#118, #130, #129 & #121), one code camp (Carolina Code Camp) and at my local UG in Charlotte. I have already got two other SQL Saturdays confirmed – #122 (Louisville, KY) on July 21 and #158 (New York City) on August 4 (so if you are around, please don’t forget to come over and say a hi). 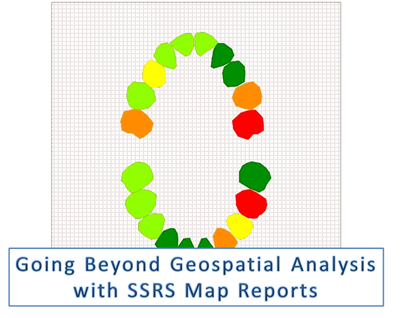 One of my favorite topics to present is on Map Reports in SSRS, and a statement that I just can’t stress enough is that the map reports feature can be used much beyond geospatial analysis. You don’t necessarily have to restrict yourself with geographical boundaries, and this post will give an example on the same. (By the way, if you are reading this post before June 26 and are interested in learning more about map reports, you might want to attend my online session – ‘Fast Track to Spatial Reporting using SSRS 2012’ through PASS BI Virtual Chapter) The inspiration for this post is a demo from the Tableau product gallery where tooth decay is being visualized using images for the tooth, and I thought of replicating the same with SSRS. Follow the steps below to make a simple report:- 1) Get an image for the tooth set and then by using an online image mapping site like Image-Maps, you can trace the coordinates. Once you get the coordinates, you can convert it into polygons using the SQL function – geometry::STPolyFromText. You can download the SQL query for the tooth set that I created from the image below There are many other ways in which you can obtain the same results, though I usually use Image-Maps because it is free. 2) Create a table called dbo.Teeth and store the results of the above query into this table. 3) Create a table called dbo. [Teeth Data] and store the results of the csv sheet below into this table. 4) Now that you have both the spatial data as well as the analytical data, create a new report and make 2 datasets – DST_Spatial for the spatial dataset (which will have the columns from table dbo.Teeth) and DST_Analytical for the analytical dataset (which will have the columns from the table dbo. [Teeth Data]) 5) Drag and drop the map report item from the toolbox. 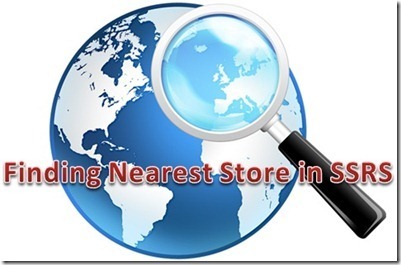 From the wizard, select the SQL Server spatial query as the data source and choose DST_Spatial as the Spatial dataset. Select Color Analytical map as the map visualization and choose DST_Analytical as the analytical dataset. The match fields should be Name and Tooth as shown below:- 6) Select Decay_Scale measure as the field to visualize and click on finish. Now we should be able to see the map report item in design mode. 7) Click on preview and you should be able to see the result. Here, I have just made a very simple report and this can be extended with all the common SSRS features like drill-down, report parameters, color formatting, tooltips, labels, etc. Compare this sort of a spatial report against a tabular report. Here, a dentist might be able to make more sense of the effect in tooth decay on neighboring teeth and hence can be very useful. Hopefully, this short post will make you think of the map report item in a new light now. How fast time flies! Another new version of SQL Server has been launched and it seems like it was only a few days ago that SQL Server 2008 was released. Those days, I was mainly focussing on SSRS, and I can’t express in words how happy I was when I saw all the new features in SSRS 2008 and 2008 R2. 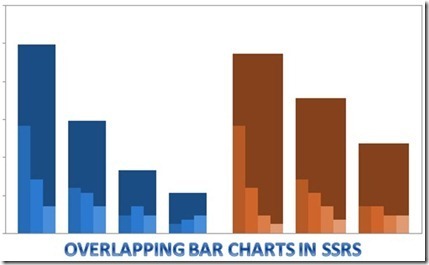 Today, I was reading through a great post by one of my favourite bloggers, Hilmar Buchta on SSRS Bar Chart Tips and Tricks and this prompted me to add a chart tip of my own here – Overlapping charts in SSRS. 1) Make a new report and use the query below to make a new dataset. 2) Make a column chart and use Sales in the Data Values, Year in the Category and Quarter in the series. 6) Change the color of the Range Column as Aqua (or any color you like) from Automatic, so that all bars of the range column have the same color. 7) You can enable the data labels for the Sales measure and disable the legend for the new calculated measure. Now if you preview the report, you will get the required result. Hopefully, this post will help in getting your creative juices flow when you are faced with a tough SSRS chart requirement! I have always been inspired by a particular quote from Arthur C Clarke – “The only way of finding the limits of the possible is by going beyond them into the impossible”. The more you think of it, the more you make sense out of it. If you decide in your mind that something is impossible, you will never even try to make it happen. Consider the example of the 10-second barrier in athletics. Rather than a physical barrier, it has always been more of a psychological barrier. How else can you explain the significantly high numbers of athletes that have broken the barrier in the last 2-3 years when compared to the 20 years between 1968 and 1988? Being mindful of that, I have always tried to be open when discussing requirements and always keep a secret list with me of the requirements that I have not been able to fulfil. 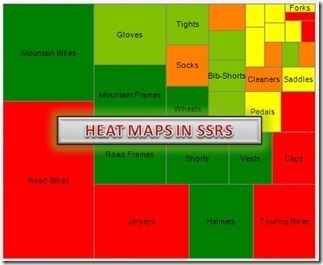 One of my earliest list items was that of a squarified Heat Map (or Treemap as they are generally called) in SSRS. Even though there is no out of the box way to do it in SSRS, it was said to be possible by using the map controls and has been shown by Teo Lachev a long time ago. I had even progressed as far as making a T-SQL procedure which calculates the coordinates of the heat maps but it just wasn’t that elegant enough to be used in a production system. However, a recent blog by Richard Mintz on the Squarified Heat Maps has finally made me strike off this requirement from my list as completed. 1) Download the HeatMap.dll file from here and save it in a location in your hard-drive, say C:HeatMap (You should see the Download option on the File Menu). This dll file is the compiled version of the code given in Richard’s blog. 2) Open SQL Server Management Studio and then execute the following code in the database that you want to create the assembly. 5) Now make another dataset which will have the analytical data used for visualizing the rectangles with colours. For this demo, I am using a MDX query from the AdventureWorks cube which will return the Subcategory Names and Reseller Gross Profit. 6) Drag and drop a Map report item from the toolbox to the design layout and select SQL Server Spatial query as the data source. On the next screen, select the spatial dataset which we had created in Step 4. 7) On the next screen, ensure that Geo is the spatial field and the Layer type is Polygon. Click next. 8) Choose Color Analytical Map the map visualization and click next. Then choose the dataset that we created in step 5 as the analytical dataset. 10) In the next screen, choose the field to visualize as Reseller Gross Profit and click on Finish. 11) Now if the report is previewed, you can see a nice heat map which will have the dimension size based on the Order Quantity and the colours visualized based on the Gross Profit. If are interested in map/spatial reports, you might want to check out some of my related posts here. Update (11/03/2012) To make it culture insensitive, the code has been modified and a new version of the compiled code has been posted here.